I would have dearly loved to have seen what sort of movie George A. Romero might have made out of the video game series, but his vision for Resident Evil was never realized and instead we saw what Paul W.S. Anderson wrought with Milla Jovovich as Alice. Jovovich made for a striking action-horror heroine, but I didn't particularly favor Anderson's style of directing, and the series of films that followed reaped ever-diminishing returns, from a creative standpoint. On the other hand, you always knew what to expect: action, blood, action, guts, action, all spewed forth at a rapid pace. 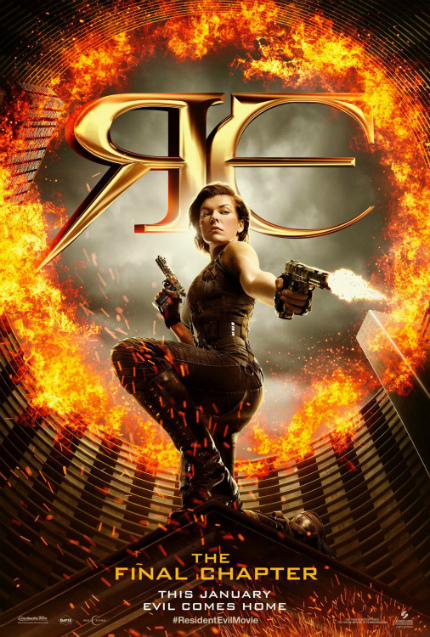 The 'final' film in the series, Resident Evil: The Final Chapter may have only made $26.8 million at the U.S. box office, but it grossed $312 million total worldwide, so of course a reboot of the property for the big screen is on its way, now under the direction of Johannes Roberts (per Variety, back in December 2018), of 47 Meters Down fame. Constantin Film is behind the big-screen reboot and is also behind a prospective new small-screen series that is under development at Netflix, per Deadline. Few details have been released: "No one is commenting but I hear the plan is for the series to expand the Resident Evil universe and deepen the exiting [sic] mythology. I hear the series will keep the basic premise, which also served as a setup for the movie franchise. "The drama series will explore the dark inner workings of the Umbrella Corporation and the new world order caused by the outbreak of the T-virus. While the project is in early stages, the series is expected to incorporate all of Resident Evil's signature elements, including action sequences and 'easter eggs.'" Yeah, it's a little hard to imagine a series without action sequences. The company has not yet announced a showrunner. Is Cursed Too Strong A Word? Stunt Woman's Arm To Be Amputated, Crew Member Crushed To Death In Separate Incidents On RESIDENT EVIL Set. It's A Sign Of The Coming Apocalypse. The Trailer For Paul W.S. Anderson's RESIDENT EVIL: AFTERLIFE Is Looking Good. Win RESIDENT EVIL: RETRIBUTION On Blu-ray! RESIDENT EVIL RETRIBUTION Breaks The Series' Continuity. So What?